Pond ecosystems benefit your fish’s health and they also help minimize your inputs and costs for maintaining your fish. 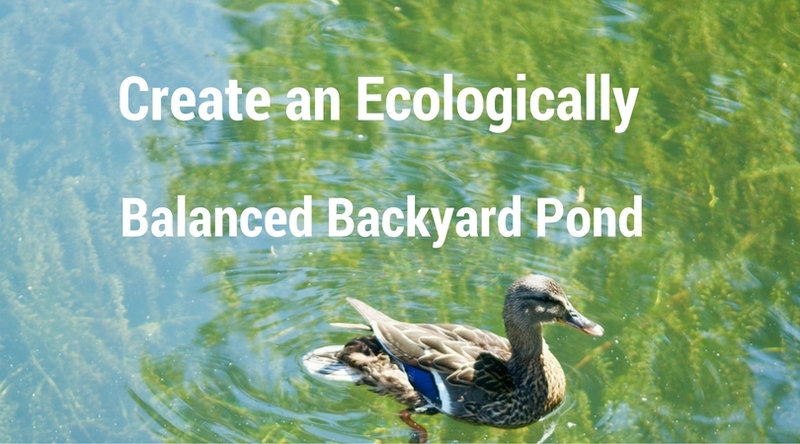 An ecologically balanced pond is environmentally friendly and economically beneficial! You may have a pond in your backyard or you may be thinking about starting your own home based fish farming business (great idea by the way). An ecologically balanced pond is important because it’s the best way to benefit from your fish pond in every way. It’s an environmentally sustainable and economically profitable way of raising fish. You’ll get maximum results, require minimum inputs, and have have the least negative impact to the environment. Your pond ecosystem is the interaction between your fish and the environment of your pond. This ecosystem consists of many things including insects, plants and other living organisms in your pond. Your pond ecosystem is also influenced by non-living things such as water quality, soil, dirt and debris, and also the chemicals dissolved in your water. Checking and monitoring the carbon, oxygen, nitrogen, phosphorus and pH balance of your pond is also important. A shallow pond with plenty of sunlight, for example, will attract more aquatic plants like algae but won’t be good enough for fish because of the low oxygen levels. A deeper and flowing pond will benefit your fish growth. You also need to have enough depth so that it doesn’t become too hot during the summer and doesn’t completely freeze during the winter. Depth also ensures enough oxygen for your fish. The best way to achieve ecological balance and maximize your benefit is to make sure that you have enough plants and insects in your system so that they can feed on each other. Also, you need to maintain water quality, control pests and predators, and ensure a natural environment for your fish. As you know, an ecologically balanced pond creates balance between your fish, insects, plants and other living and nonliving things so that they support each other and coexist just like how they would in nature. We’ll discuss all aspects of an ecologically balanced pond below. Food producing plants: They provide food, shelter and oxygen for your fish. 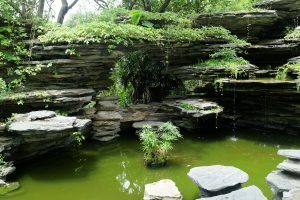 You ought to add a wide variety of different aquatic plants to achieve a natural look and also reduce the algae growth in different areas of your pond. Plants like Java moss (Vesicularia) and Hygrophila are excellent plants for your pond. They grow fast on rocks or driftwood and are sturdy and soft enough for your fish to nibble on. 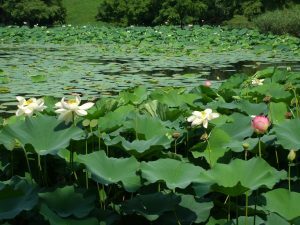 Natural biological filter plants: Certain floating plants like water lettuce and hyacinth are fast growing and act as natural biological filters. However, they can use up a lot of nutrients from your pond, so restrict their growth in certain areas of your pond only. Physically remove any debris from trees around your pond. Use a net and pickup all branches, leaves or the like. Anything that can decompose and add pollution or sediment at the bottom needs to go! Keep your water flowing and use net to filter out your water. Add more elements to enhance beauty and efficiency of your pond. You might want to add a waterfall, add more plants along the margins, maybe some stone statues, whatever you want! Elements like a park bench can make your pond look more attractive as well as functional. Adding rocks and gravels will add to the excitement and ecological balance of the pond. An ecologically balanced pond does not require a lot of input from you. It’s functional, economical and attractive. Most importantly, an ecologically balanced pond is a sustainable way to produce your own food or even make some extra cash from your home based fish farm. These tips will help you to create an ecological balance in your backyard pond. P.S: To learn more about how you can start aquaculture in your backyard pond click here join us on our weekly webinar course on Aquaculture. For more informative articles read our blogs or visit our Facebook page! Do You Want To Build A Natural Fish Pond in your Backyard? 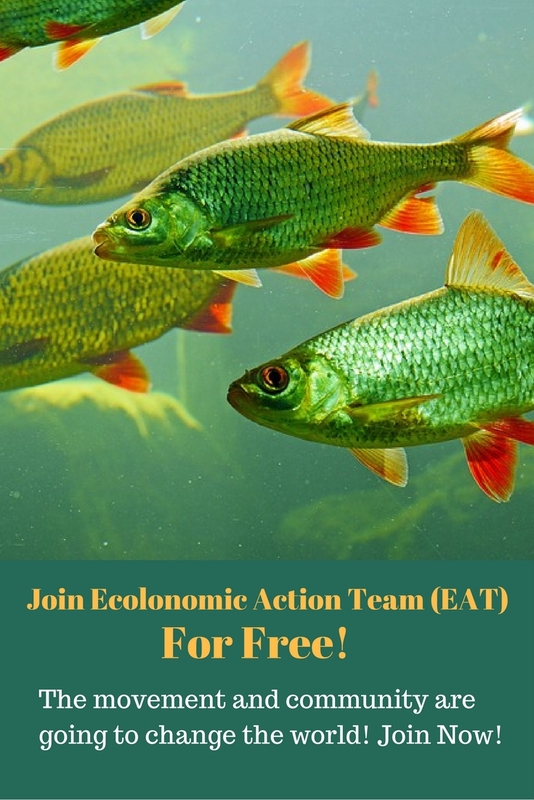 Yes, You Can Make Money with Ecolonomic Aquaculture!